Ferrari Enzo is one of the most expensive cars in the world today. The car can be described as a perfect combination of performance and elegance. Ferrari Enzo is the highest top speed Ferrari and can travel up to 225 mph. 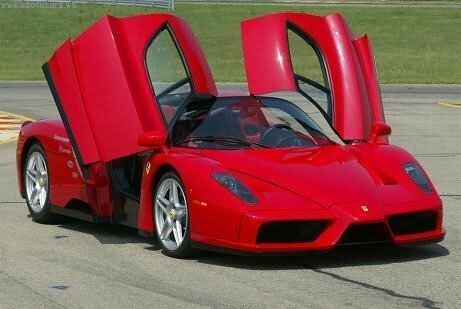 Ferrari Enzo is a 2 door, 2 seater car. The frontage consists of broad headlights and carbon fiber front bumper. The rear consists of beautiful taillights. The supercar presents a very sporty look. Ferrari Enzo is equipped with active suspension for comfort riding in the sports mode. The interiors are mostly designed of carbon fiber. The car is fitted with a powerful A.C., navigation system and optional launch control. Ferrari Enzo features aerodynamic subsystems for better safety and performance. The car also features Anti Braking System and power steering. Ferrari Enzo is a mid-engined car. The Enzo’s V12 engine is the first of a new generation for Ferrari. The engine is Ferrari’s F140 65° V12 with 4 valves per cylinder, dual overhead cams and visible valve timing. Bosch Motonic ME7 fuel injection is used and the engine is naturally aspirated. The engine displaces 5998 cm³ (366 in³) and produces 660 PS (651 hp/485kW) at 7800 rpm and a torque of 657 Nm at 5500 rpm. The redline is 8000 rpm. The transmission is a 6 speed automated manual with paddles controlling an automated shifting and clutch mechanism. Ferrari Enzo uses 483 mm (19in) wheels and has 381 mm (15 in) Brembo disc brakes. The car can accelerate to 100 km/h (62.5 mph) in 3.2 seconds and can reach 100 mph in 6.6 seconds. The ¼ mile (0.4km) time is 10.8 seconds and the top speed is estimated at 225 mph. It is rated at 8 mpg (29.4L/100km) in the city and 12 mpg (19.6L/100 km) on the highway. The current cost of Ferrari Enzo is estimated to be over $ 1,000,000. However, the price specified is approximate and it may be much more in case of auction.